The sign used to say “Waseca High School.” Now 7th and 8th graders have been added to the mix. Just one of the many changes that took place in the last 20 years. I realize most people relish their high school graduation day because it means they don’t ever have to go back to the school again. I am not one of them! 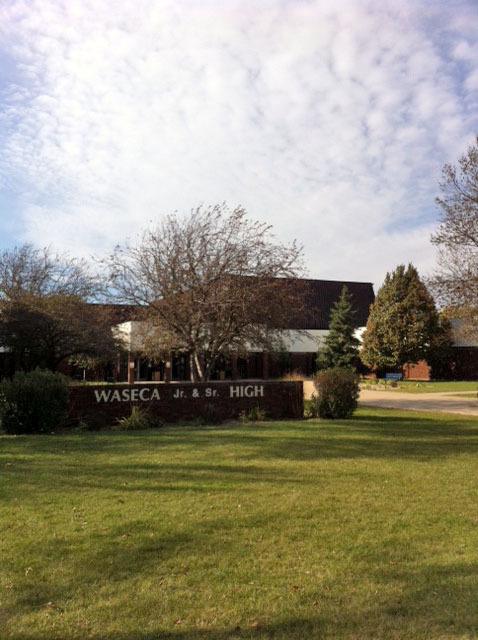 I enjoyed all four years of high school, so you can imagine my happiness at being asked to return to my alma mater to talk to Waseca freshmen about writing memoir and personal narratives. 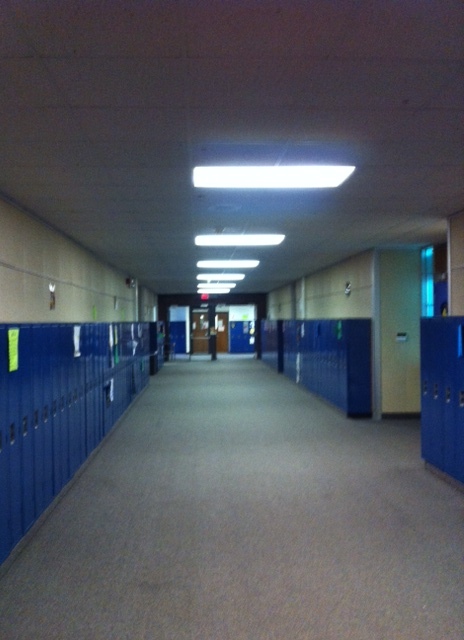 I spent the day in Waseca’s junior/senior high’s B-wing. 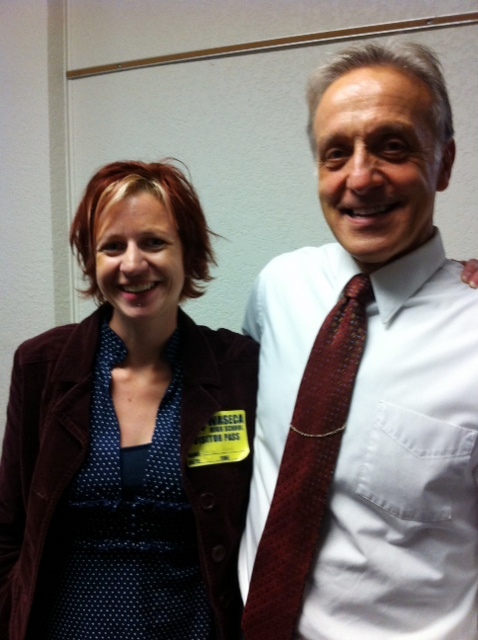 I was in Mrs. Arndt’s old classroom, Mrs. Henderson’s old classroom (which still contained Mrs. Henderson’s podium!) and the Little Theater (which is now used as a regular classroom–weird!). One of the hallways looking north. The doorways at the end of the hall used to lead directly outside. But a media center has been added on. It sure makes the view look a lot different than what I was used to! The kids had many good questions about the writing process and about Waseca. For example, how has Waseca changed in the last 20, 30 years? They seemed truly amazed that Waseca once had a main street full of specialty stores such as a shoe store, a bakery, and a full-fledged, three-story J.C. Penney department store. They wanted to know when McDonald’s came to town and when Taco John’s appeared (this was directly before the lunch period!). I made sure to tell them the amount of work that goes into writing a book. I asked them if they’ve ever been asked by a teacher to do a second draft of a paper. Yes, they groaned! I asked if they liked doing that. “No!” was the general consensus! I said my book went through seven drafts, and I got by easy in comparison to other writers I know. 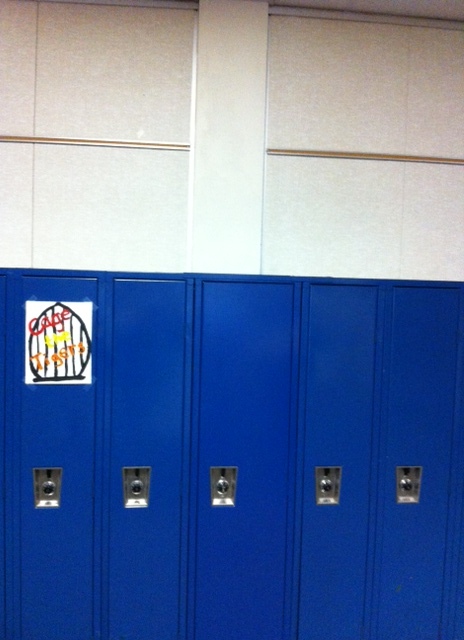 The location of my locker. The old, taller yellow lockers have been removed and replaced with these short, blue versions. My locker was to the left of that beam. A trash can or fire extinguisher (I can’t remember which) was located right in front of the beam, which gave me a little extra elbow room, for which I was forever grateful. Ben’s locker was to the right of the beam. I will also be forever grateful that Ben was my locker neighbor. I knew that the seventh and eighth graders had moved into this building a few years ago, but it didn’t cross my mind that the seventh- and eighth-grade teachers also had to move in 🙂 When Mrs. Kopetzki led me down the hallway in the morning, I was so excited to see this sign! Because I always loved reading and writing, it’s no surprise that I loved Mr. Oraskovich’s class and that I can remember it so clearly. As a young writer, I received a lot of support and encouragement from Waseca’s English teachers. Mr. Oraskovich was one of the most enthusiastic and passionate teachers; that attitude clearly rubs off on eager students. It was an honor for me to tell him in person what a great teacher he was. I think every author has a stand-out teacher or two to whom they can attribute part of his or her success. 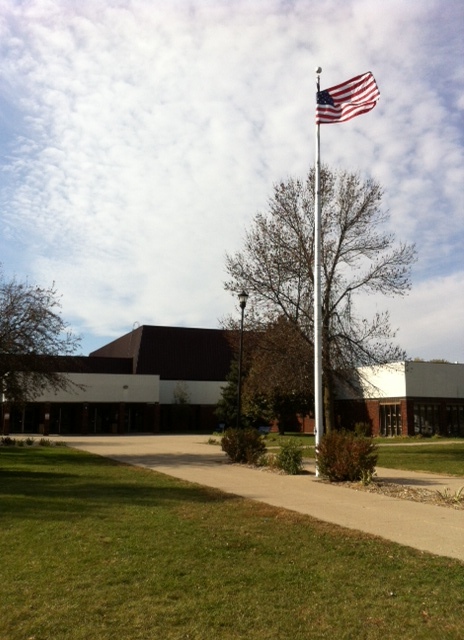 Thanks for the memories, Waseca High! Special thanks to Tracy Kopetzki, for her work in arranging everything! I also sincerely thank the Waseca PTO for its big role in my visit! This entire post made me smile! Thanks for sharing this, Rachael! This was so fun to read. And to see a picture of you and Mr. Oraskovich! I was back in Waseca this past weekend and I spent time going through some of my old boxes and totes to eliminate or bring back to Bemidji with me. I ran across a note from Mr. Oraskovich that he wrote to me after my 8th grade year. That I saved and it’s now here in Bemidji with me. He is an outstanding teacher! Makes me want to step back into the Jr/Sr High and say hello to some people the next time I am down… 🙂 Anyway, so glad you were able to inspire students in Waseca. They were blessed to have you! I can’t remember why your name came up when I was talking to Mr. Oraskovich, but he remembers you (were you friends with his daughter?) and how nice your mom is 🙂 Everyone should be so lucky to have such wonderful and inspiring teachers! Thanks for the walk down memory land. I haven’t been inside the high school since I graduated, and I still picture the school’s yellow lockers. At first it sounded strange that the Little Theater was a classroom, but then I realized it’s like a small college lecture hall. When I was in school the Little Theater wasn’t used for much except for some after-school activities. It was too small for plays or anything like that. It does look like a smaller lecture hall, though. No author visits when I was in school either. We had the occasional “lyceum” in the gym and I cannot recall any of them. What does “lyceum” mean anyway? I need to look up that obsolete word. 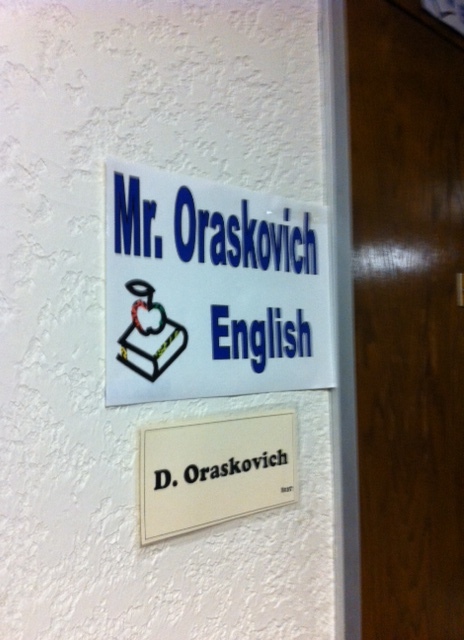 Just like Mr. Oraskovich inspired you, I am sure your presentation inspired some budding writers. Kudos to you, Rachael, for sharing your passion with these students. What a great experience! I still remember when authors visited my elementary and high school. It was so thrilling. In their words, they were excited to have a “celebrity” come to the classroom! I honestly cannot remember having any author visits when I was in school. I would have loved that, too.